As soon as the updated opening theme began and the titles appeared, I felt the nostalgia of all of those memorable hours of playing various Final Fantasy games come flooding back. Hours of fantastic storytelling and exciting battles, hours of grinding mobs and trying to perfect your Chocobo mating skills! The Final Fantasy series may have taken a slight lull in quality in recent releases in my opinion, but that does not mean that I do not get excited about each release as it is announced and still do not enjoy driving around in my Regalia with the latest group of boy band heroes. There have been plenty of off-shoots of the original games. ‘Theatrhythm’ and ‘Theatrhythm Final Fantasy: Curtain Call’ for the Nintendo DS gave us a music based game play experience similar to guitar hero. The recent ‘World of Final Fantasy’ game was almost Pokémon-esque in its gameplay, Chibi characters capturing famous Final Fantasy creatures and using them to battle others. I suppose that it is my enthusiasm for all things Final Fantasy that elected me as the person to review this latest release. But it was sure to turn everything that I previously knew about the enigmatic game series on its head. 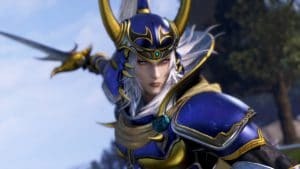 Having not played any of the previous Dissidia games I did not know what to expect when I received the Beta test code for the newest addition to the series – Dissidia Final Fantasy NT. 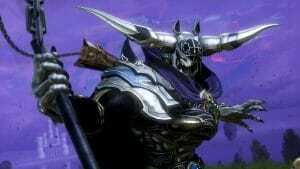 All my knowledge of the previous Dissidia titles was that they were fighting games. A genre of game that I have not really embraced since my Tekken 3 /Dead or Alive 2 gaming days. Still, I was willing to give it a try and not go into it with any predisposed notions of what to expect. There were two options when I started the Beta, Practice mode or Online 3 vs. 3 mode. Deciding that it was probably best not to jump right into the deep end, embarrassing myself online with my rusty beat em up fighting skills, I decided to do the smart thing and start a practice match. Well, as soon as the character choice exploded onto the screen and I saw that infamous blonde spiky hair we all knew what hero I was going to pick. Cloud Strife’s class was Vanguard and all I needed to choose was what battle set I was going to pick for him. Set A which included Cross Slash, HP Regen and Poisonage or Set B which was comprised of Meteorain, Mighty Strikes and Share Bravery. Two random CPU picked characters filled up the rest of my team, Tidus from FFX and The Warrior of Light from the original Final Fantasy. Now we were ready to enter the battlefield and conquer our enemies or in this instance other heroes in a 3 vs. 3 showdown. The arena itself was expansive, lots of levels and great detail that often gets thrown to the wayside in the assumption that players are going to be so focused on the action that they are not going to take the time to look at the definition on the nearby fir trees. The abilities that I had picked with the Vanguard character class seemed to be straight forward enough and myself, my team and a brief cataclysmic appearance of Shiva dispatched the opposing side quickly and effectively. ‘Great I thought,’ looks like I am ready for the real deal, time to face some real players online! Well I waited and I waited, but the game never did find me any opponents, so back to practice mode I went, this time picking Lightning from FFXIII and Ifrit as my choice of summon. It was a different arena, and the abilities were altered but luckily for me, we disposed of Squall, Zidane and Onion Knight in the fiery rain of Ifrit. As with most fighting games, the gameplay is repetitive which is fine for those who like that style of gameplay. Whilst the selection of characters, summons and the battlefields were well thought out and put together, I found that the brawl style fighting was not for me. If there was some tactical element to the gameplay then I could not seem to find it. Perhaps it would have benefitted from some sort of playable tutorial to highlight what I should have been doing rather than just button bashing, or if there were more ability combinations to pick from then it would feel like your choices were making a real difference. But as it was I felt I was stuck in the same rotation of moves for much of the action. After doing more research into the title I found that Dissidia Final Fantasy NT has already been released in Japan since 2015 as an arcade game title. This explains a little more why the combat style is simplistic and easy to pick up. Either way, I enjoyed my experience of pitting famous Final Fantasy heroes against one another to see who would come out on top, I am sure whilst playing online with your friends you can establish some pretty epic battles. Dissidia Final Fantasy NT will be released January 30th, 2018 for PlayStation 4.